A father’s wounded heart. A mother’s patient love. An eager boy, an impetuous girl, and, above all, the healing power of nature. These are the classic ingredients that fill Virginia Sorensen’s Newbery Award-winning novel with a tender power and lift it to classic status. 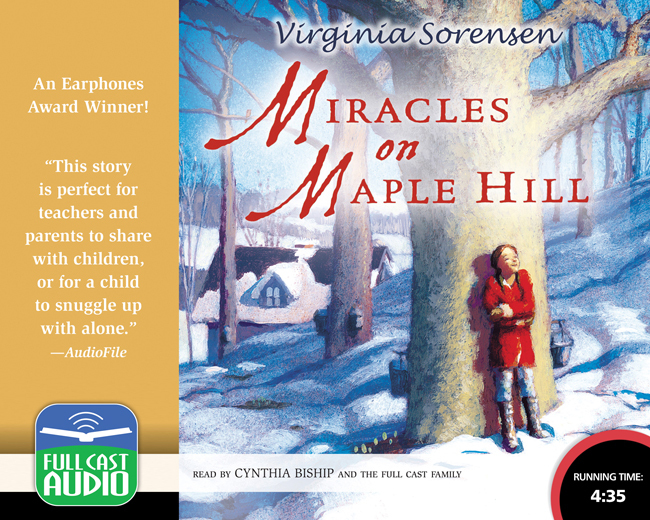 First published in 1956, Miracles on Maple Hill is almost uncanny in its appeal for today’s young listeners. For here is the story of a father returned from war in a distant land, wounded in body but even more in spirit, and a family desperate for him to be returned to wholeness, a wholeness they hope can be found on Maple Hill. With language that is tender, precise, evocative, and yet fiercely powerful, Sorensen draws listeners into a year in the family’s life, a year filled with small miracles that yield great reward.